Last year when I wrote the post Can Muslims Follow the Biblical Christ and still be Muslim?, about four people, all of them missionaries, wrote me and told me that I had to read Paul Gordon Chandler’s Pilgrims of Christ on the Muslim Road. I did. It’s every bit as good as what I heard, though the book led me to raise a different set of questions than the ones that drove me to read it in the first place. Call it an unintended consequence, but after reading Chandler’s soul-stirring account of Mazhar Mallouhi, the Syrian novelist who started his life as a Muslim, then converted to Christianity as a soldier in Gaza, and now calls himself a Sufi Muslim follower of Christ, I found myself caring less about what Christ looks like on the Muslim road and more about what Christ might look like on the American road. Mazhar Mallouhi is a fascinating person indeed. After he renounced his Islamic culture and converted to Christianity, he found himself in the same position that many Muslim-background believers find themselves in–alone in both worlds. In order to fit in to the Arab Christian world, Mallouhi had to prove his “Christian” credentials by bashing Muhammad and despising all things Islam. Arab Christians expected him to change his name to a “Christian” name, use “Christian” greetings, and dress like a “Christian”–erasing all traces of Islam from his cultural heritage. To make the long story short, Mallouhi underwent a profound identity crisis that eventually led him to the realization that he doesn’t have to abandon his Islamic culture, nor does he have to call himself a “Christian” to be an authentic follower of Christ. Mallouhi realized that he could present a Middle Eastern face to Christ through his life, his ministry, and his writings. While his life over the past few decades reads like that of a modern day Apostle Paul, complete with persecutions, imprisonments, and deportations, it’s Mallouhi’s writings that have captured the heart of the Muslim world. In the Arab world, Mallouhi’s novels have been compared to the likes of Dostoevsky and Tolstoy. With grace and sensitivity, Mazhar Malloui has introduced millions of Arab Muslims to Christ–all through legal distribution channels. Lo and behold, who’s the individual that inspired Mazhar Malloui to dedicate his life to Christ? Gandhi. Seriously. This is really bugging me. How can a guy like me, a guy who eats at Taco Bell, watches American Idol, and ocassionally yells at his kids, how can a guy like me truly follow Christ on the American Road like some of the world’s greatest luminaries have followed Christ on their roads? When Gandhi threatened to fast until his death, Hindus and Muslims stopped killing each other. If I did that…well…I would die. If Jesus wanted to walk the American road through me, what would that look like? Would he want me to speak out against a grave injustice, or perhaps write a soul stirring novel? Would he have me visit a homeless shelter or comfort a person dying of Aids? I don’t know, but now that a new year is approaching, I think now is the time to start asking these quetions. I found this link a gripping story of a leader in the Palestinian non-violence movement. Yes, there is such a thing as a non-violence movement among Palestinians. Here is how they are treated. 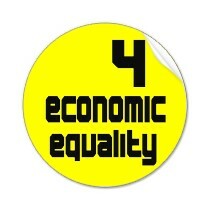 What does God think of economic equality? In American evangelical circles, there’s an idea that goes something like this: progressive taxation = socialism and socialism=satanic. Never mind the fact that both Thomas Jefferson and Adam Smith (the founder of modern capitalism) favored progressive taxation, I’m wondering where we got the idea that political structures aiming for economic equality–or at least some semblance of economic equality–is a bad thing? One of the reasons that many evangelicals believe the Apostles never attacked the institution of slavery directly is because they wanted slavery to lose its grip in the community of the church first so that society would eventually follow suit. Might the same principle also apply to economic equality? We know that early Christians in the Book of Acts practiced a form of voluntary socialism, but how much have we pondered what the Apostle Paul says in 2 Corinthians 8:13-14? I think it’s a devastating indictment on the way things are today that we don’t even aim for this in our churches…but I digress. Here’s my question. If God’s vision for the Body of Christ is economic equality, then what does that say about God’s vision for society at large?